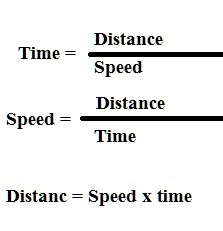 The formula for Time speed and Distance is also a favourable math topic for all competitive exams. Always, ask one or more question from this chapter in the exam. Already, we have learned Profit and Loss, boat and stream formula, Time and works, Easy Division rules, Simple and compound interest chapters, Average, and many more shortcuts math formulas. Now, we are going to learn shortcuts formula for time speed and distance chapter. As per the regular post, fast of all, I'm giving you some basic formula in an image. You may download this image for regular views to memorize this shortcuts formula easily. Above, just I had given you some basic shortcuts formula of Time Speed and Distance chapter. But sometimes, we need to convert time and distance unit according to the asked question. Because in question, you may see variations in hours, minute and second and on another hand Km and metre. So, we need it to convert as per the requirement of questions. Km/hour will be converted in meter/hour multiplying by 18/5 and meter/hour will be converted in km/hour multiplying by 5/18. Here, I'm solving some basic questions using the above formulas which will help you to observe how to execute the time speed and distance problems easily? Please note, usually, this type of question is not asking for competitive exams. Yet, these formulas are very important to solve advance level time speed and distance problems because these are basic and heart and soul formula of this chapter. A bus travelled 200 km in 4 hours. In what speeds ran the bus? A bus is running at a speed of 60 km per hour. How many kilometres will cover in 5 hours? So the distance will cover =5 x 60 km = 300 km. Now we are moving to Advance shortcut formulas of Time and speed math chapter. Which is usually asks on competitive examination like SSC, PSC, Railway recruitment, I.B and many more examinations. 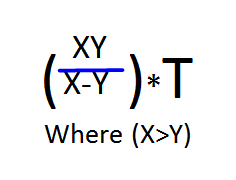 In the above formula, X and Y are the speed value of the train. It may be in meters, Km or mile unit. Please remember both journeys should be the same distance. otherwise, this formula does not apply. A train started running to a station at the speed of 60 km per hour and came back at the speed of 50 km per hours, then what is the speed of the train, in its whole journey?